School is back in session and my kids are in a new school. I didn't want to throw them a party before school started since they didn't know anyone yet. Now that they've gotten into the groove and made friends with some of their classmates, I thought I'd throw a School is Cool party for them to celebrate the new year! This may be the easiest party I've thrown yet. For real. The reason? 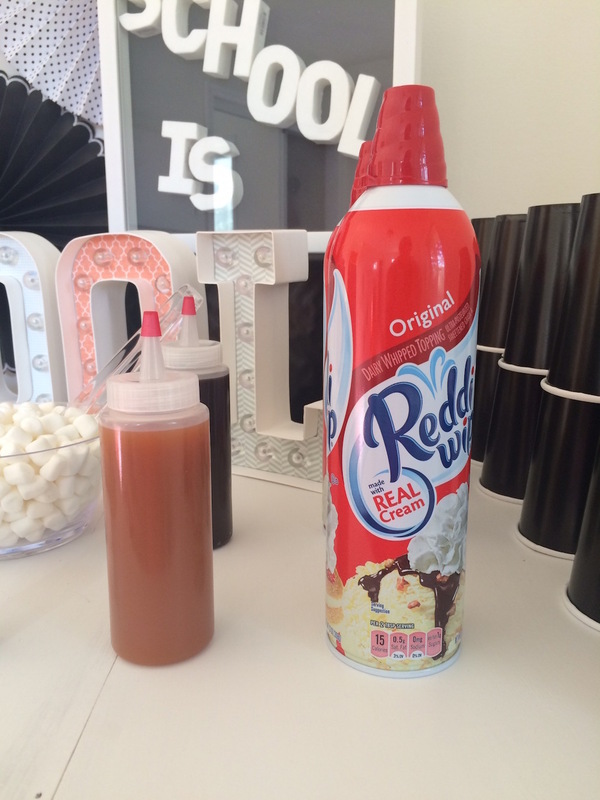 Making my version of awesome desserts kid-friendly by using Go-Paks!, Snack Pack Pudding, and Reddi-wip! I knew I didn't want to spend a lot of time (or money) on the food since my kids are willing to eat almost anything. So I decided to create recipes that were delicious and FUN! I took some of my favorite desserts and simplified them using Go-Packs! and Snack Pack Pudding with some Reddi-wip thrown in for good measure. I put my recipes on my IKEA chalkboard that served my "back to school" theme but also reminded me of a food truck. Perfect for food you can eat on the go! In case you can't read my fantastic handwriting (lol), these are the recipes I came up with. The best part for me was I didn't need any additional bowls or plates. Everything fits into the Go-Pak! After choosing their recipe, the kids could squeeze in the pudding and top with the remaining ingredients. Just grab a spoon and go! Because what kid wants to sit still at a party to eat? Just make sure you have black cups at the ready for water. Just write the kids' names with a white marker and they'll always know which cup is theirs. 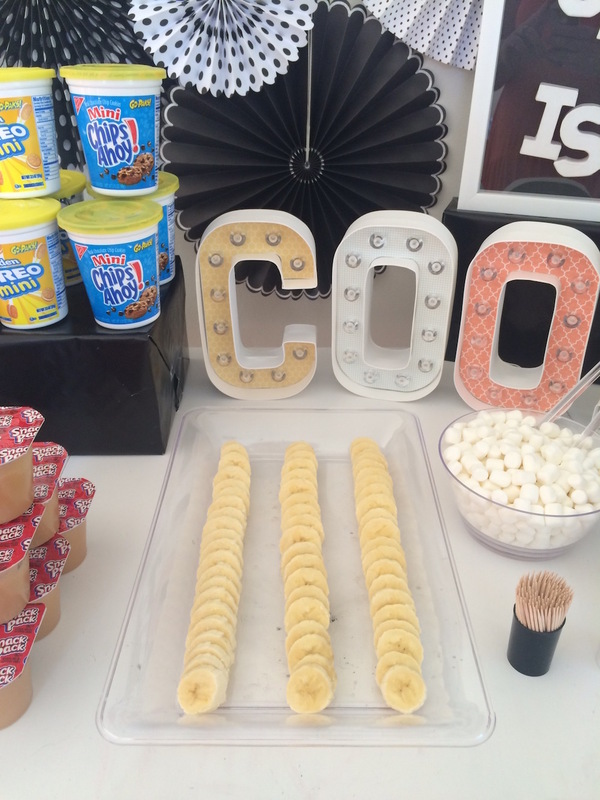 I found these amazing marquis letters from Scrapbook Steals and knew they'd be perfect for the party. I didn't want everything to be black and white so I inserted some paper from My Mind's Eye that coordinates with the photo backdrop I made (pictures to come!). The party fans on the wall are My Mind's Eye too. They have the best party supplies! I love how everything turned out. The food fit so well on this desk I made for my daughter. The plans are from Ana White and I couldn't wait to showcase my first big build at this school-themed party! 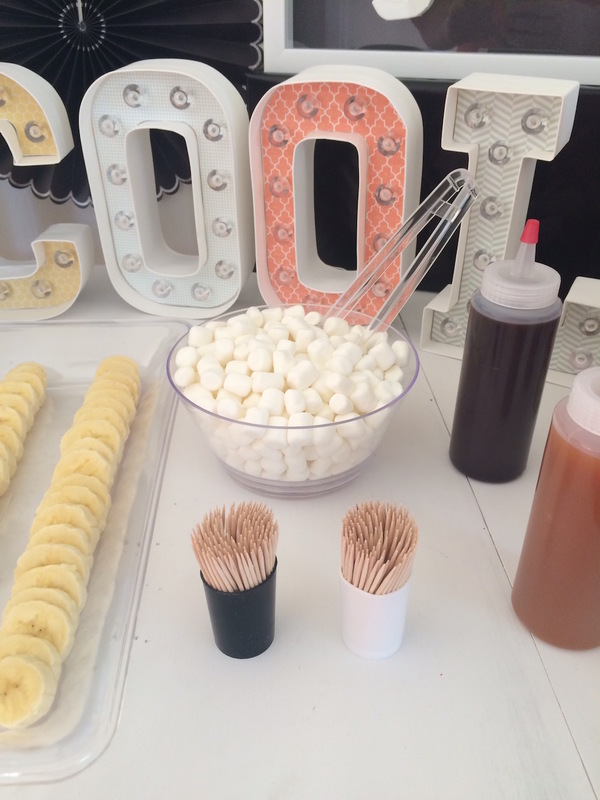 Want to try your hand at your own simple dessert recipes using Go-Paks! from Walmart? You can typically find them in a large container by the registers. And they're only $1, so stock up!